"As I told you when we met, we're probably going to ask a bit more of you than your typical client does, but it will be about things we can do together to help firefighters all over the world," says Deputy Chief Jon Ibrahim of Hearts In Motion and Fire Service International, nonprofits based in Indiana. Lynden Account Executive Ollie Ladd and Ocean Operations Manager Dave McGeath worked with Jon to coordinate the move of a 20-foot container filled with donated firefighting equipment from Hearts In Motion to the San Francisco dock for ocean shipment to Guatemala City. The equipment was bound for some of the world's poorest firefighters in Central America as they combat the aftermath of the eruption of the Fuego Volcano this winter. Hearts In Motion has been providing firefighting assistance and Emergency Medical Services (EMS) to Guatemala for 35 years as well as Nicaragua, Ecuador and other parts of Central and South America. Ollie, Dave and the Lynden team pulled the Guatemala move together in just one week, working against last-minute deadlines and changing requirements. "When you consider that these donations were sitting in a warehouse and within a week they were loaded into a container and on the sea, it really speaks to Lynden's capabilities, and how employees bent over backwards to help us out, not just with the logistics, but also the communication and walking us through the process," Jon says. "We are going to have a long-term relationship with Lynden because of the personal touch of everyone involved. When I was there it felt less like a business meeting and more like I was just having lunch with a Chicago buddy." "It is rewarding to know that we had a hand in sending relief to the people of Guatemala who are struggling with the aftermath of the volcano," Ollie says. 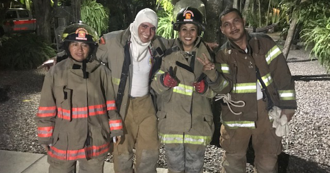 "Jon tells us the shipment made a huge difference in the lives of the firefighters in Guatemala and El Salvador who can now do their jobs safely and more effectively." When an aircraft is grounded, or Aircraft On Ground (AOG), every minute counts. Regular aerospace customer UTair recently asked for Lynden's help when one of its passenger planes was grounded waiting for a new engine. The Lynden International team quickly scheduled trucks to transport the heavy haul freight to Miami International Airport, took care of customs documentation and booked a flight to move the 15,000-pound engine to UTair's Moscow hub within four days. "We usually deliver smaller parts for the Russian airline, but this request gave us an opportunity to show that we can handle any size freight – and come through on a critical shipment," says Sergey Buchumov, Head of Business Development and Sales in Moscow. S7 Airlines is the second largest airline in Russia and a long-time Lynden International customer. Over the years, the carrier has called upon Lynden for a variety of projects. A project toward the start of this year involved disassembling an Embraer E-190 aircraft in Madrid, stripping it to the wings and fuselage and shipping the spare parts to S7 subsidiary Nelson Parts in Bend, OR. According to Sergey Buchumov, Russia Sales and Marketing Director, Lynden was handling about one shipment a week ranging from an Auxiliary Power Unit (APU) to a fuel thruster weighing 2,000 pounds. "This project required many of our services," Sergey says, "such as brokerage and hazardous freight transport for aviation batteries." The first shipment of 8,000 small parts required 8,000 line items with all the necessary documentation for each. This inaugural shipment also included a freak snowstorm in Madrid that shut down roads leading into and out of the area. 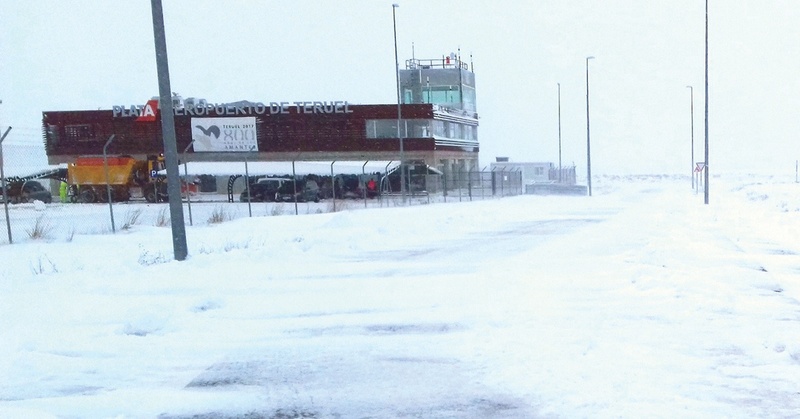 "Snow in Spain was not the type of hurdle we were anticipating with this project," quips Daniel Gotham, Business Development Director, Global Projects. "They don't salt roads in Spain." Lynden provided customs and import services to the U.S. and door-to-door delivery to the Bend airport and the airport hangar where the parts were consolidated and stored. When the aircraft parts were eventually sold to domestic and international buyers, Lynden handled that as well, which included ocean and air transport. "We are often moving the same parts twice; from Russia to the U.S. and then again from Oregon to a new destination," Sergey explains. In addition to S7, Lynden serves nine other Russian aerospace customers from its offices in Moscow and St. Petersburg. For those producing aircraft, Lynden moves production parts and for those already in operation, repair parts for Aircraft on the Ground (AOG) situations and other needs. Parts are often sourced from Boeing and other U.S.-based suppliers allowing Lynden to call upon its network of Service Centers for expedited service. In addition to handling critical samples for the Ebola vaccine in West Africa, Lynden International is supporting the U.S. Agency for International Development (USAID) by coordinating the transportation of HIV rapid test kits to Zambia. Lynden International Business Development Director Dan Gotham has worked with the federal agency for many years and says Lynden is proud to provide a strong link in the global health supply chain. "In the past we've provided disaster assistance and rapid response with our Hercs and multiple transportation options," he says. Now, Lynden is supporting the test kit distribution as part of the President's Emergency Plan For AIDS Relief (PEPFAR) established in 2003 to address the global HIV/AIDS epidemic and help save the lives of those suffering from the disease, primarily in Africa. Lynden coordinates the shipments of temperature-sensitive, high-value kits to South Africa. "We may have 30,000 kits in one 34-pallet shipment and 18,000 in another shipment of 55 pallets," explains Eric Klunder, Senior Account Executive. "We recognize the significant health impacts of each shipment and use extreme care at every step of the process." Lynden will handle the shipping through 2020 with destinations varying according to global health needs. "Besides delivering important cargo, we also serve as advisors to USAID," Eric says. 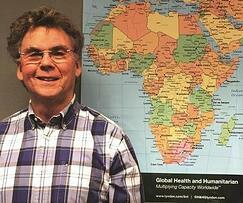 "We have experience in the global health field and in serving challenging areas with developing economies. Our specialty is coordinating diplomatic clearance within those countries." Earlier this summer, the 21st FIFA World Cup 'kicked' off at Moscow's Luzhniki Stadium. The international soccer tournament draws huge crowds cheering for their countries and teams. Lynden played a crucial role in the success of the 2018 games by shipping high-value, fragile camera rigs and equipment from New York to 12 Russian stadiums to ensure that the whole world could see the month-long competition. The camera rigs were controlled by smartphones for the most technologically advanced coverage of the World Cup ever. According to Lynden International Business Development Director Dan Gotham, the project developed from a quote request Lynden received on its website. Customer Global Octagon asked for Lynden's expertise to guide the fragile electronics through customs by the deadline of the first game. "We helped the customer choose the most effective import mode to Russia," Dan says. "By selecting a temporary import, we avoided potential duty and Value-Added Tax (VAT) for the import and eliminated the need to reexport the cargo. We worked daily with both shipper and consignee to troubleshoot during the customs import process in Russia, ensuring the cargo was released in time for the event." Lynden also handled the export packing and return shipment of the camera rigs after the event. Phil Maxson recently returned from the EBOVAC-Salone Labs at Kambia District Hospital in West Africa. That's where Lynden's customer, Clinical RM, is working on a clinical trial of Ebola vaccine in Sierra Leone. Ebola is a rare and deadly disease caused by infection with one of the Ebola virus species. Lynden International has been assisting government and non-government organizations with transportation and logistics in West Africa since the Ebola crisis in 2014. "This particular project involves Lynden transporting human blood samples from the clinical trial to the U.S. and Europe for testing," explains Phil, Lynden International's Director of International Operations. "Each LN2 Shipper can accommodate up to 405 2ml vials, and is equipped with a GPS-temperature sensor so at any time, (except when on an aircraft in the air), we can monitor the temperature and see exactly where the unit is anywhere in the world," Phil says. 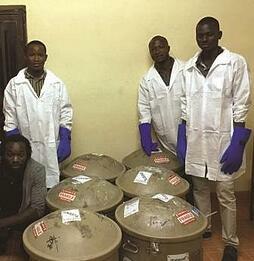 "First we ship the charged, but empty containers into Sierra Leone and then deliver them to the laboratory which is about three and a half hours from Freetown, Sierra Leon's capital city." Once the lab has loaded all the samples into the special canister containers (see photo at right), Lynden handles the shipping of the units to various labs located in the U.S. and Europe. Lynden International handles the transportation of over 400 shipments per year into and out of Africa for various organizations; many of these are temperature-controlled products requiring specialized handling. 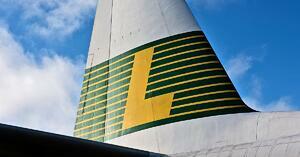 Lynden International caught the wave—and made sure the wave caught the flight from London to Honolulu. 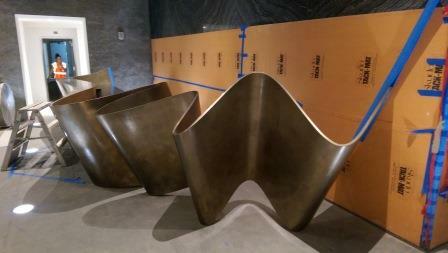 A 30-foot-long custom desk designed to resemble undulating water, the 'wave' is one of countless items Lynden has shipped to Honolulu for the construction of Ward Village, a 60-acre master-planned community boasting 4,000 residences and more than a million feet of shops, restaurants and entertainment venues. "We were contracted to provide furniture, fixtures and equipment for all the public space for Ward Village, including the penthouses and the pool area," explains Randy Gentz, President of Hospitality Freight Company (HFC) in Las Vegas. "The oversized desk for the lobby was a beast and one of the most difficult things we have ever asked Lynden to ship for us—in the dimensions, 30 feet by 8 feet, fragility and its value of $250,000." Designed in England and made of resin, the wave arrived in Honolulu in a special crate. Due to its size, it required a sky crane to set it in place and secure it into position. With Lynden's help, HFC this and other work for Ward Village by the deadline. In addition to unique designer desks, Lynden ships flooring, appliances, furniture, bathroom fixtures and other freight to support the hotel industry. HFC is a freight company dedicated to providing its clients with the best possible freight rates and service on hotel furniture, fixtures and equipment (FF&E). The company has counted on Lynden to make good on its promises for 32 years. For Ward Village (pictured above), Lynden moved domestic freight to its Los Angeles warehouse where the team consolidated weekly air and ocean shipments to Hawaii as the construction schedule dictated. The pieces included unusual items like an oversized dining table that required removal of a window for crane placement inside an upper floor unit. Late last year, HFC also completed the 38-story Ritz-Carlton Residences in Honolulu and is currently at work supplying materials for the Wilshire Grand project, a 73-story, 900-room hotel on Wilshire Boulevard in Los Angeles. When completed, it will be the tallest hotel west of the Mississippi. Lynden has provided warehousing, shipping and deliveries for the project from the beginning and will continue until it is finished this summer. "I choose Lynden because they perform," Gentz says. "From providing quotes quickly to all the weird stuff that comes up with international air and ocean freight, they are always flexible and creative. Looking down the road, we may be working on a years-long monster project 20 times the size of Ward Village. Lynden was the first company I thought of to ship the variety of freight needed." Two years ago during the West Coast labor dispute, Lynden's creativity came into play. HFC was facing delays at U.S. ports and needed to move FF&E from Vietnam to Chicago for a hotel grand opening. "By routing ocean shipments to Prince Rupert, B.C. then rail, the less-urgent cargo was on its way and we avoided U.S. ports," remembers Dave McGeath, Ocean Operations Manager in Seattle. Commercial flights and a chartered 747-400 freighter from Vietnam were used for the hottest shipments and overflow. "Our goal is to create partnerships that make our customers successful and allow them to get those 'heads on beds' by hotel deadlines," explains Charlie Ogle, Lynden's Senior Director of Global Sales. Hotel-condo conversions, hotel renovations and construction of new condominium hotels with mixed use space are sweeping the U.S. In some markets, like Miami, there has been a 15 percent reduction in hotel rooms as they are repurposed for condos. Whether condos or hotels, the freight deadlines are non-negotiable. "These projects are high touch and high pressure," Ogle says. "They are notorious for running late due to late signoff of designs, funding and manufacturing delays. Materials orders are often placed when projects are already behind schedule. Customers look to the logistics provider to save the day. That's when our multi-modal mix of transportation comes into play." Lynden's array of air, sea and surface choices allows customers to create customized domestic or international transportation plans to accommodate a mix of slower moving freight as well as expedited cargo. "We often move furniture from the manufacturer's factory overseas all the way through to delivery at the project site or project staging warehouse," Ogle says. In the event of time critical FF&E air transport or expedited domestic shipments, trucking can be arranged so that hotel equipment installation schedules are kept on schedule. The ramifications of late or missing freight in the hospitality industry can be serious business. Hotel owners cannot afford to turn away confirmed guests due to a renovation project running behind. "Our job is to make sure the FF&E is there on time. Since we are the last cog in the procurement wheel it's up to us to proactively follow the customer's shipments and make adjustments mid-stream if necessary to meet installation deadlines," Ogle explains. "We design the solution around the needs and desires of our customers." 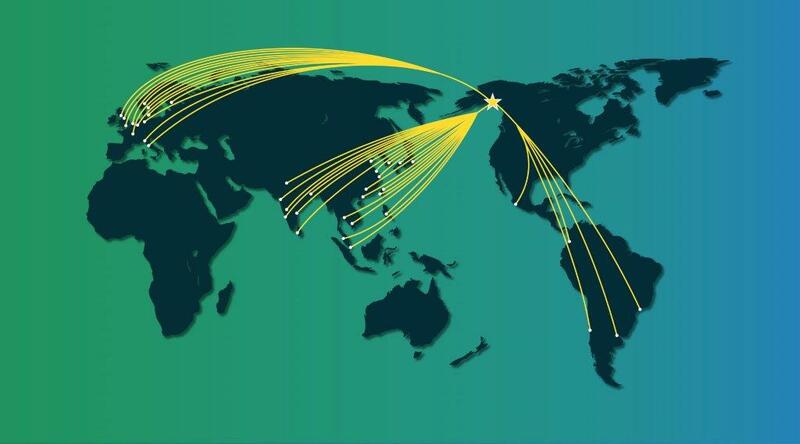 Through its worldwide network of international partners and sister companies serving Alaska, Lynden International introduced a new service this spring offering seamless Less-than-Cargo-Load (LCL) and Full-Container-Load (FCL) transportation to Alaska from foreign ports around the world. Whether it’s a pallet of fishing gear from China or a full container load of machinery made in Germany, Lynden can handle it all the way from origin to delivery in the 49th state. “This product is unlike anything we have offered before and unique in the industry,” says Charlie Ogle, Lynden’s Senior Director of Global Sales. Working with its contracted ocean carriers and Shipco Transport, Lynden now provides port-to-door through ocean rates from more than 50 major ocean ports around the world to Alaska. FCL customers save money, time and potential cargo damage by eliminating the transfer of cargo from one container to another in Seattle. LCL customers enjoy a single factor “all in” rate from the origin warehouse to door delivery in Alaska. Lynden can also handle all import requirements with U.S. Customs through its customs brokerage department in Anchorage. “In this buy everywhere-sell everywhere world, Lynden’s new ocean product literally brings the world to Alaska customers,” Ogle explains. Gas tank drained. Check. Battery cables tied back. Check. Original Bill of Sale and shipper photo ID. Check. After 18 years at Lynden International and countless global shipments, International Agent Colleen Delaney knows what is needed to ship just about anything overseas. Automobiles have become her specialty over the past few years as she handles the safe ocean transport of vintage automobiles from the U.S. to the U.K. for London-based American Legends, LLC. “We don’t typically ship vehicles, due to the extensive paperwork and customs requirements, but we will handle this type of shipment for customers who approach us with these special requests,” she says. So far, Colleen has handled the transport of Corvettes, Mustangs, Ferraris, a 1965 Buick Riviera and she is preparing to ship over a Trans-Am from the Smokey and the Bandit film and a replica of the General Lee, a 1969 Dodge Charger from the TV show The Dukes of Hazzard. When it comes to loading and securing the valuable automobiles into containers Lynden turns to trusted partner SeaPac Transportation Services of Seattle. “We use SeaPac for all our ‘special needs and delicate handling’ FCL shipments,” Colleen says. President Paul Kimball was Lynden Transport’s Vice President of Administration in the 1970s and understands the Lynden brand of customer service and excellence. In addition to cars, engines and other specialty parts are palletized and shipped via ocean for the company. “SeaPac is the best of the be st in this area. We won’t partner with just any company – we require top notch service to keep our customers happy,” Colleen explains. The export of vehicles requires an extensive amount of paperwork. The original title and Bill of Sale is required by customs to prevent stolen freight. Customs filing must also be presented 72 hours prior to the sailing of the vessel so that the vehicle is available for inspection by customs if they so choose. “Lynden International offers this premium service at reasonable prices compared to other forwarders,” Colleen says. Most of the classics that Lynden ships for American Legends are headed to auctions in London or are sold to car collectors throughout Europe. SEATTLE/HAMBURG – Lynden International, a full-service freight forwarding and logistics company, has entered into an exclusive agreement with its German partner Hermes Transport Logistics to strengthen the company’s services between North America and Germany. The two companies will focus on developing new business in Canada, the U.S., Mexico and Germany with a goal of providing both Lynden and Hermes customers an enhanced, premium service. “Although Lynden and Hermes are based in different countries, we share the same corporate spirit and culture. This agreement will position both companies to enjoy greater successes and provide expanded services and products to our customers. The agreement strengthens Lynden’s capabilities in retail supply chain services, fulfillment and home delivery in new markets,” says Dave Richardson, Lynden International President. “We are excited about the opportunities this agreement presents to us. Expanding our work with Lynden positions us as a stronger international logistics provider,” says Stephan Schiller, Hermes Managing Director of Sea and Air Freight. Lynden International is one of the Lynden family of companies whose combined capabilities include worldwide air and ocean forwarding, third-party logistics, trade show shipping, shipping to Alaska, truckload and less-than-truckload transportation, scheduled barges to Alaska and Hawaii, charter barges, intermodal bulk chemical hauls, scheduled and chartered Hercules L-382 cargo aircraft and multi-modal logistics. Lynden International was just voted No. 1 among air freight forwarders in the annual Quest for Quality awards presented by Logistics Management magazine. Hermes provides international logistics services to the retail industry. Headquartered in Hamburg, it is a wholly-owned subsidiary of the Otto Group. The company is a leading specialist for retail-related services and partners with numerous sellers in Germany and internationally. The range of services provided by the 12 Hermes companies embraces the full length of the supply chain: sourcing, quality assurance, transport, fulfillment, home deliveries and two-man handling. In 2014 the Hermes Group grew consolidated revenue to 2.230 billion euros and increased the number of employees to 12,470. Hermes operates worldwide and has established country companies in the U.K., Russia, Italy and Austria.